Venturing to discover a remote corner of southern India, I loved the pomp and pageantry of the Taj Falaknuma Palace hotel. 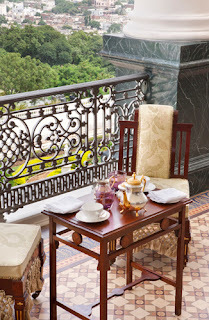 I was dazzled by the hotel’s Italianate loggia, sublime suites, and a vivid sense of history. 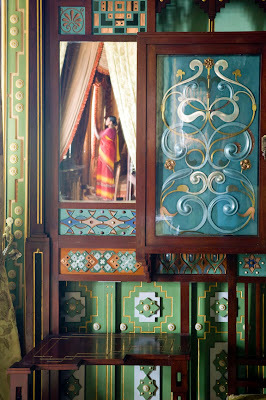 I explored rooms resplendent with fine craftsmanship and dizzy with over-the-top embellishments. Part museum, part palace, and with every corner open to fortunate guests, the hotels displays the bravado and cosmopolitan tastes of a princely dynasty that ruled the region from 1724-1948. Two thousand feet above the Indian city of Hyderabad stands the imposing Falaknuma Palace, the newest palace hotel of the Taj Group. 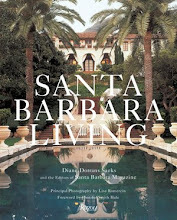 It was once the super-luxe private realm of the richest man in the world. Legends tell of showers and baths that poured forth scented water. Mounted cavalries protected the gates. 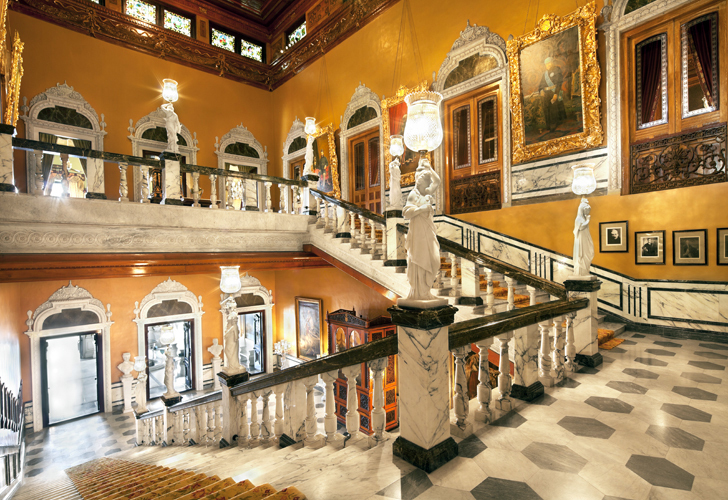 Marble statues and chandeliers were imported from Europe by the hundreds. Crowned heads of Europe and England arrived en masse. 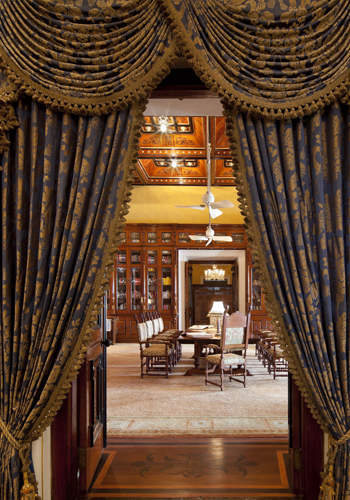 It’s now a hotel on the grandest scale, at once sumptuous and surprisingly cozy and inviting. I recently dropped in for a few days. 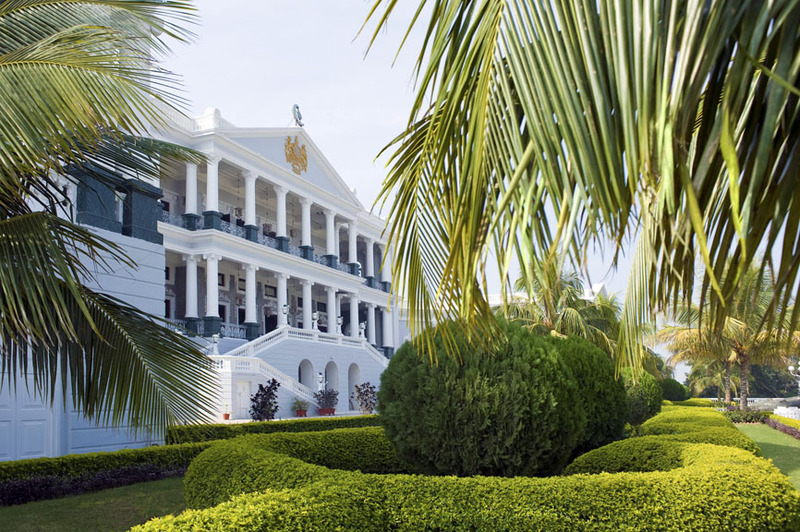 Built in 1894 for the Nawab Vikar-al-Umra, and later used as the Nizam’s guesthouse, the hotel opened November 21 after a ten-year refurbishment and decoration. 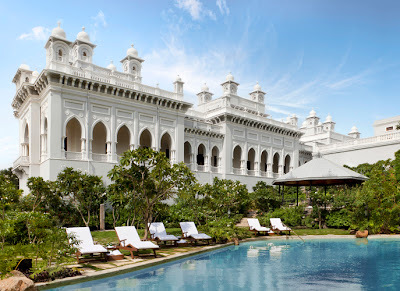 I flew to Hyderabad a week after the hotel opened, landing at the Palladian/baroque gatehouse of this stunning Italianate palace beneath the noonday sun. After twenty-seven hours in transit, from San Francisco via Munich to New Delhi and then off to Hyderabad on the vivid green Deccan plateau in south central India, I was stepping back to 1894. 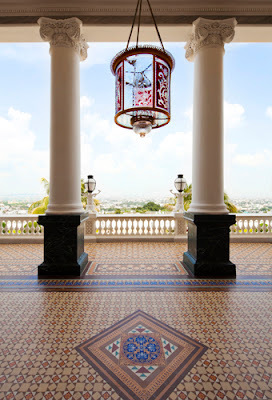 Imagine arriving at an Indian palace in a horse-drawn 1890s carriage painted with arabesques of gold, greeting the hotel director, and being showered with crimson rose petals as I climbed the white marble stairs to the main entrance. 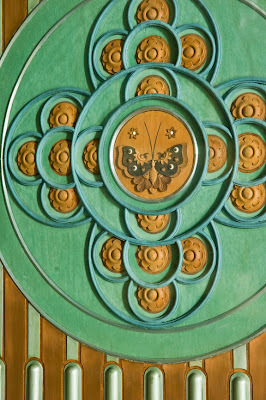 The petals drifted down from a second-floor balcony, scenting the air. Lovely. 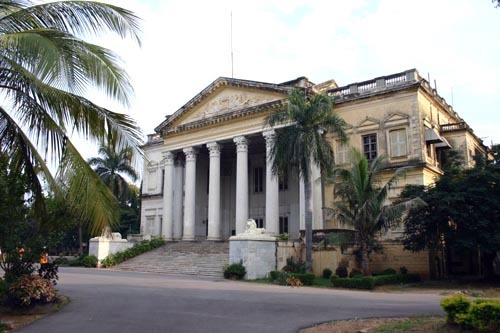 The Nizams, the hereditary dynasty of this rich and strategic region, used the palace as a guesthouse. The family had a fascination with Europe, and were committed Anglophiles. The foyer, sitting rooms, and the family’s suites, preserved intact, all resemble a fantasy Continent, not India. 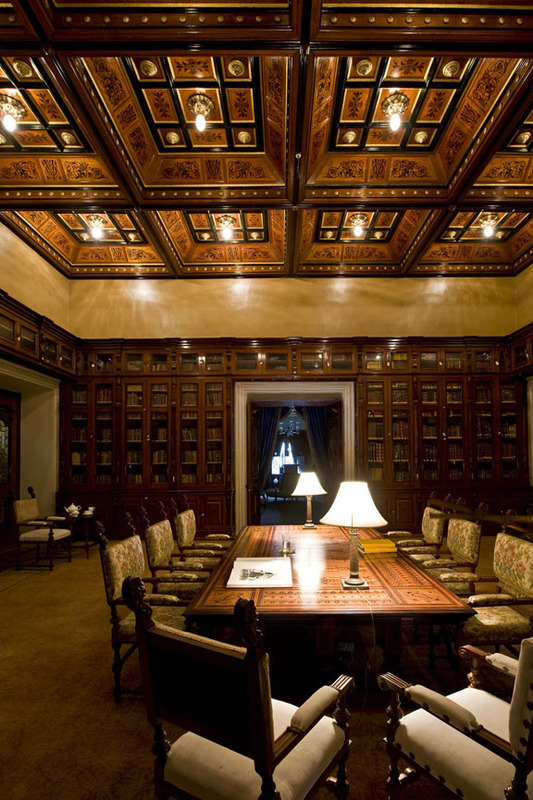 A grand 6,900-volume library, with an inlaid coffered ceiling and walnut paneling, was said to be inspired by one at Windsor Castle. Marble statuary of goddesses and nymphs, rather frou-frou for India, was brought in from Rome, and life-size portraits of imposing English royals were commissioned in London. Hours later, rose petals were still fluttering from my hair. 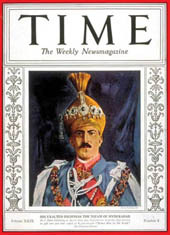 The Nizam, dubbed 'the richest man in the world' in the forties. An emerald turban ornament, formerly in the treasury of the Nizam of Hyderabad. A peridot belt, one of the ornaments of the Nizam. I met up with the courtly hotel historian, Mr. Prabhakar Mahindrakar, formerly a family retainer, and wandered with him through the Orientalist arts-and-craft-style card and chess rooms with all original furnishings, past the German baroque dining room with eight-feet tall cut-glass chandeliers, and up a marble staircase. 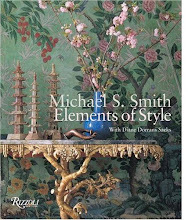 I viewed Chinese porcelains, Alma-Tadema-esque romantic portraits, 17th-century Persian urns, Japanese screens, Edwardian billiard accouterments, and gilded French fauteuils, an exuberant mingling of design idioms. The Nizams entertained here--and guests today can relax here, free to dream of convoluted histories. Mr. Mahindrakar told tales of nobles and nawabs and nabobs and their acquisitions, their meetings with Queen Victoria, banquets, Russian royals, rococo revival, and the visit of the crown prince of Germany. 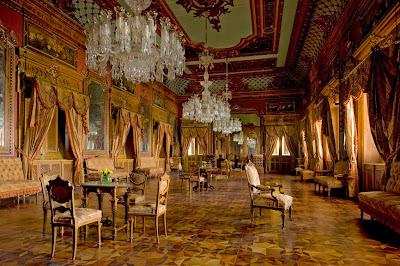 Oh, imagine the ballgowns, and the grandeur of traveling to Hyderabad in the days of private railways and entourages. 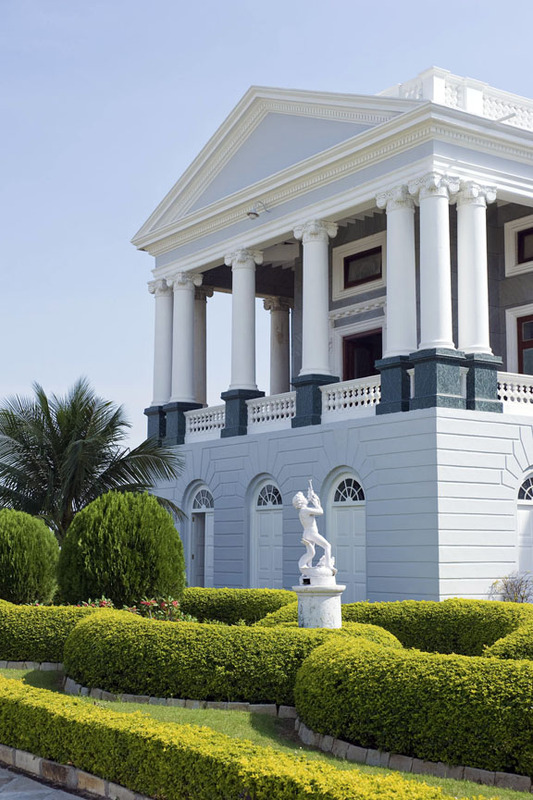 Falaknuma Palace or ‘Mirror of the Sky’, completed in 1894, was a residence of Nizam Mehboob Ali Khan. 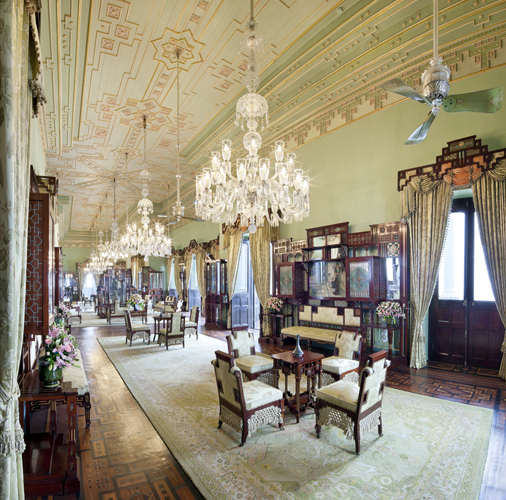 It was once the sole preserve of visiting royalty—King Edward VIII and the last Russian Tsar, Nicholas II, and Indian maharajahs and their retinues. 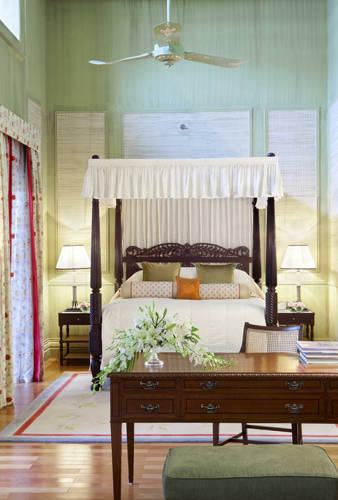 After years of sensitive restoration (it took four years to source and weave ivory silk jacquards for the Jade Room alone), the Taj Hotel Group has infused new life into this sixty-room palace hotel. 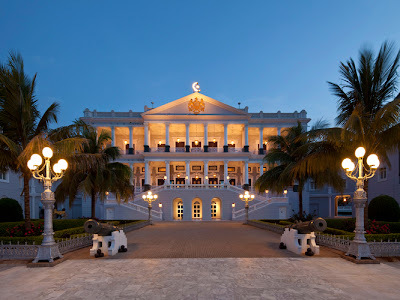 Falaknuma Palace offers a choice of unique rooms and suites, with two restaurants, an outdoor pool, the Jiva Spa, all surrounded by minarets, clocktowers and private gardens, spread across groomed 32 acres. I was especially impressed with the three historical suites, all decorated with exquisite artwork and fringed and tasseled fabrics along with antique furniture, Orientalist/Edwardian in style. 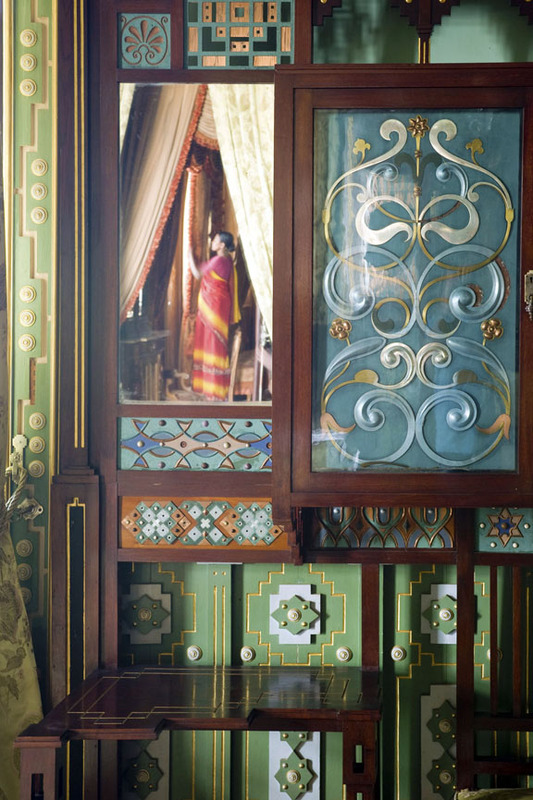 Eight ultra-private royal suites have beautiful architecture and opulent décor are part of the Zenana section of the palace. 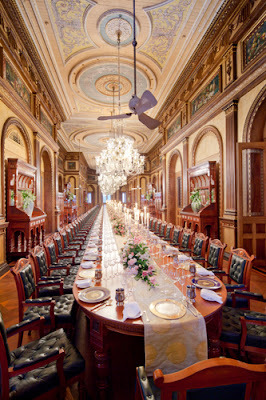 One of the grand royal suites named ‘Begum’ situated in the Zenana Wing (the private women’s realm) retain its original character and architecture. 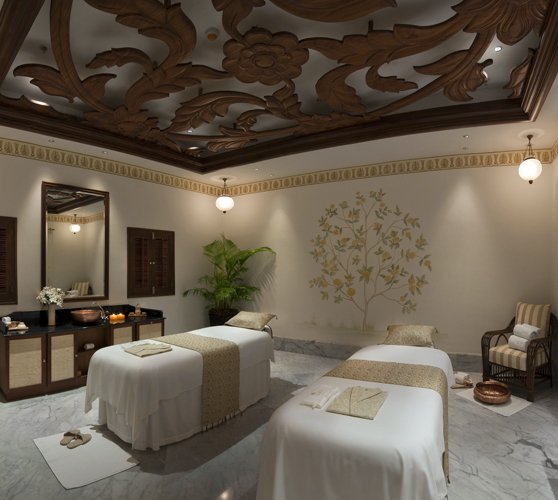 The stately duplex suite with a private pool and an exclusive access to Jiva Spa overlooks private gardens. Each has a personal butler. 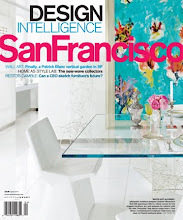 I chatted to the hotel's executive chef, Ashfer Biju, a worldly and charming talent who studied at the culinary academy in the Napa Valley, and was familiar with The French Laundry and other top restaurants in California, and knew every corner of San Francisco's Ferry Plaza farmers' market. 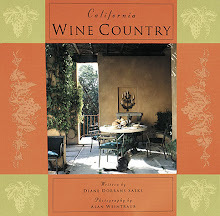 His cuisine, Indian-inspired, reflected his travels and would easily garner three Michelin stars (in California). 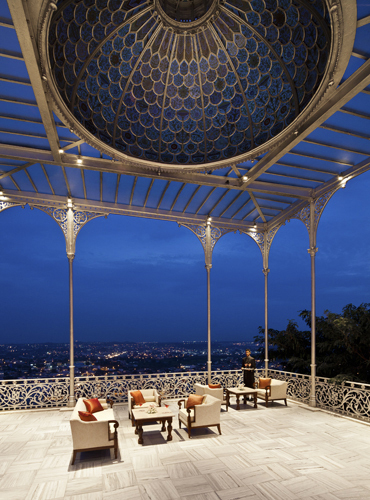 On the belvedere, a group of traditional Hyderabad musicians in orange turbans and tunics played harmoniums, an array of tables and drums and sang of love and longing. I liked the Hyderabadi specialties at the modern Indian restaurant so much I left the Italian restaurant until my next visit. 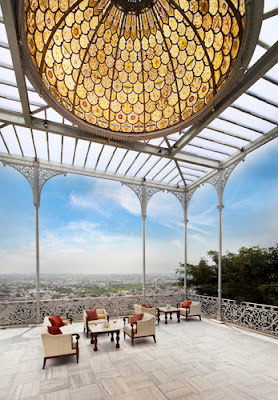 Sharon Fernandes, the assistant manager, proposed an excellent Hyderabad schedule, including stop at the Jade Room for afternoon tea where I could peruse and ponder the Nizam’s decorum and his grandiose panorama. From replicating the chatoyant tapestries made of metallic copper yarn to refurbishing the Venetian chandeliers, each detail has been carefully restored under the personal supervision of Her Highness Princess Esra, the first wife of the last Nizam of Hyderabad. 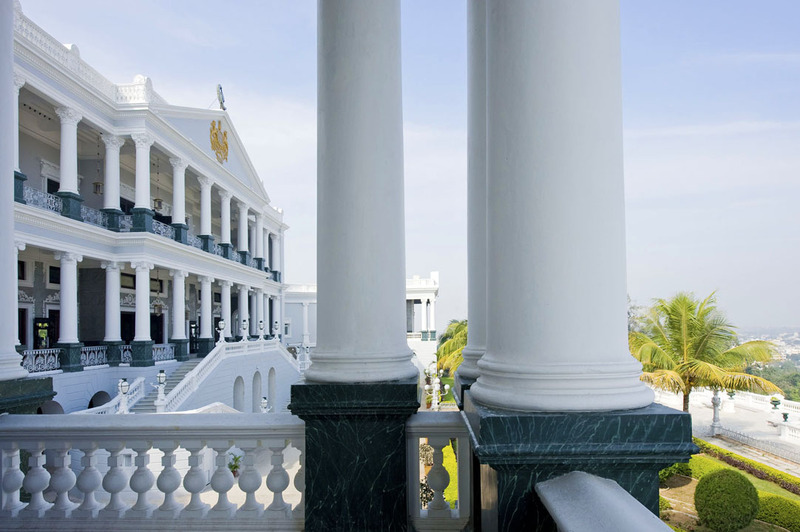 I spent my days at the Falaknuma Palace exploring the romantic gardens and visiting every silk-swagged corner. 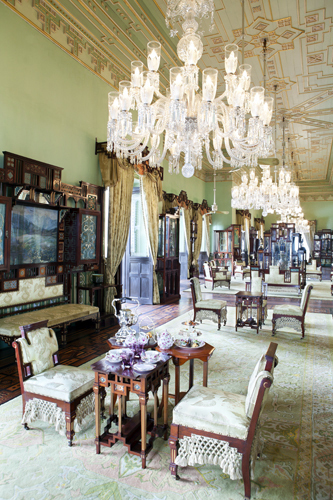 Despite the grandeur of this every surface embellished atmosphere, the visit was soothing, gracious, and enchanting. I headed out early into the hurly-burly of Hyderabad with my butler/guide, Mayur Sharma, to wander through other restored Hyderabad palaces of the Nizams. I stopped to buy pearls at Mangatrai (since 1937). Up and up, I climbed steep granite steps of Golconda Fort, once the scene of garrisons, padlocked steel trunks full of diamonds, and endless pleasure palaces and languid gardens. I was very fortunate to have as my guide Mayur Sharma, an accomplished member of the hotel staff, who was knowledgeable about the history and complexities of the Nizam’s palaces. 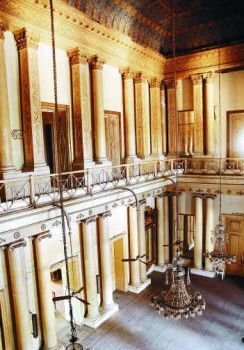 I later went in search of the grand Palladian villa that once housed the British Residency. Completed in 1805 by Lieutenant-Colonel James Achilles Kirkpatrick (a key hero in ‘White Moghuls’ by William Dalrymple), it includes a pedimented façade with grand white marble columns, a pair of rather friendly lions in gray marble, and a romantic air of dusty oblivion. 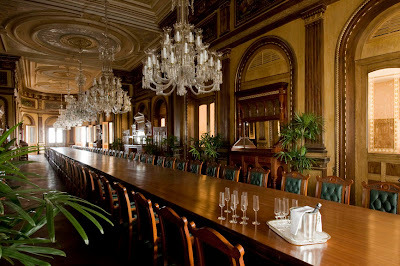 The interiors of the building, now on a list of one hundred World Heritage sites requiring immediate restoration, include a gilded ballroom, stairs lit with dusty fragments of Belgian cut-glass chandeliers, and dusty deserted desks and a jumble of chairs belonging to the Osmania University College for Women, to which the Residency now belongs. Faded glory. I was given permission to enter the deserted Residence. 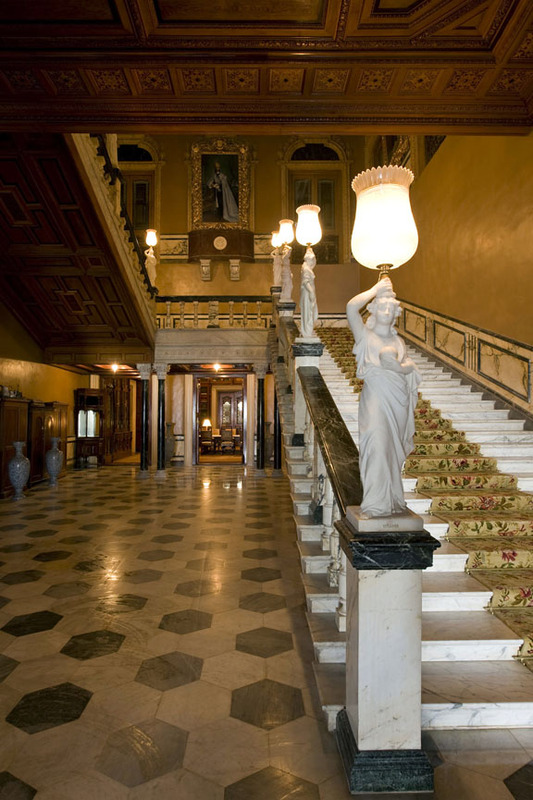 Followed by a grizzled watchman jangling his keys, I climbed the elaborate staircase, peered over the balcony into the darkening ballroom, and gazed at photographs of Gandhi on the crumbling plaster walls. I heard the sound of distant gavottes and laughter, and echoes of three hundred years of British rule in Andhra Pradesh. 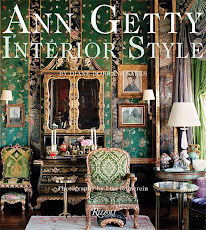 I could have stayed in this dreamy palace for weeks, drifting from the tuberose-scented study, with its chartreuse silk jacquard-covered settees, up the cantilevered Carrara marble staircase and across acres of hand-woven carpet to the glorious Jade Room once more. There, seated in a carved rosewood chair with an elaborate skirt of hand-knotted and tasseled ivory silk, I would sip Earl Grey tea, nibble on sesame cookies, and complete the fascinating biography, ‘The Last Nizam’ by John Zubrzycki. I would take time to ponder the glittering rise and rapid fall of the rulers of this wealthy state, who owned diamonds by the trunk-load (and truckload). 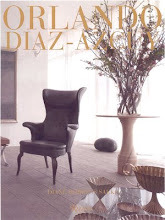 So, did I meet the Nizam? 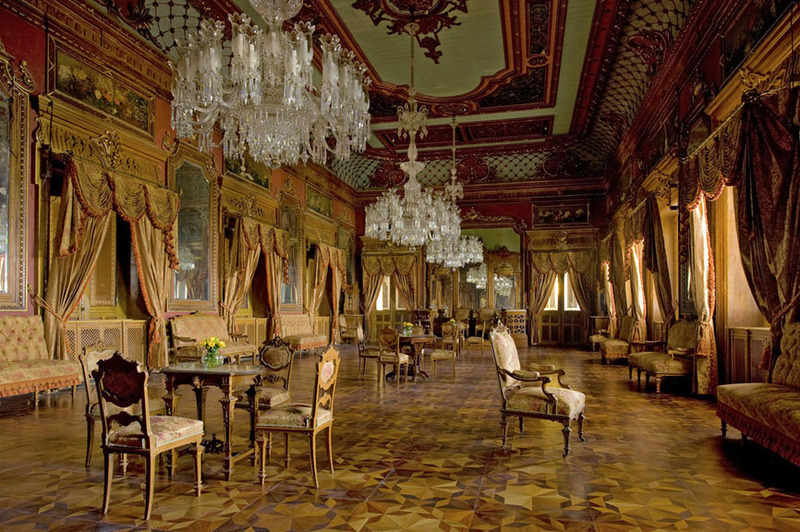 The last Nizam, now in his eighties, lives ultra-privately in Turkey, also the home of his first wife, Princess Esra, who supervised the refurbishment of the Falaknuma Palace. 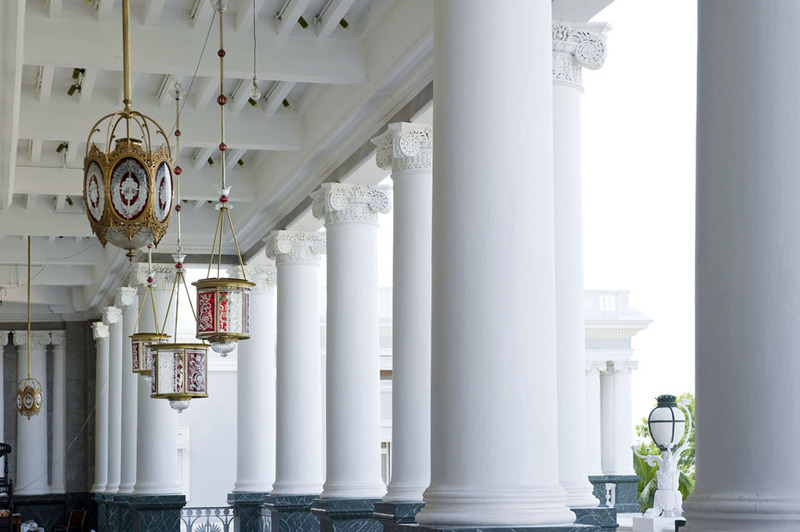 I can only rejoice at their kaleidoscopic extravagance at the Falaknuma Palace, and admire the Nizams’ legacy of beauty, craftsmanship and finesse. Author John Zubrzycki, who is based in Sydney, has enjoyed a 30-year long association with India. From stints as a traveler and scholar of Hindi, he progressed to diplomat, journalist and writer-in-residence. His first book 'The Last Nizam: The Rise of India’s Greatest Princely State’, sold out within days of being published in India and is now in its fourth edition. 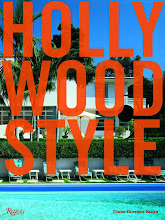 The book has also been a bestseller in Australia and is being made into a documentary film. Author William Dalrymple was born in Scotland and brought up on the shores of the Firth of Forth. In 1989 Dalrymple moved to Delhi to research his second book, 'City of Djinns'. He has written numerous bestsellers and was the founder of the legendary Jaipur Literary Festival. Admired internationally for his superb interpretation of the Indian subcontinent, he is also beloved among scholars in India. He lives on a farm outside Delhi with his family. Fascinating! I particularly enjoyed the former British Residency. I was greentinged around my neck when I heard you were in India ...my whole body is now a very vibrant green! I've started saving....thank you for the latest travel idea! What a fascinating story. You have just given me something new to read up on. What an amazing and rich post! 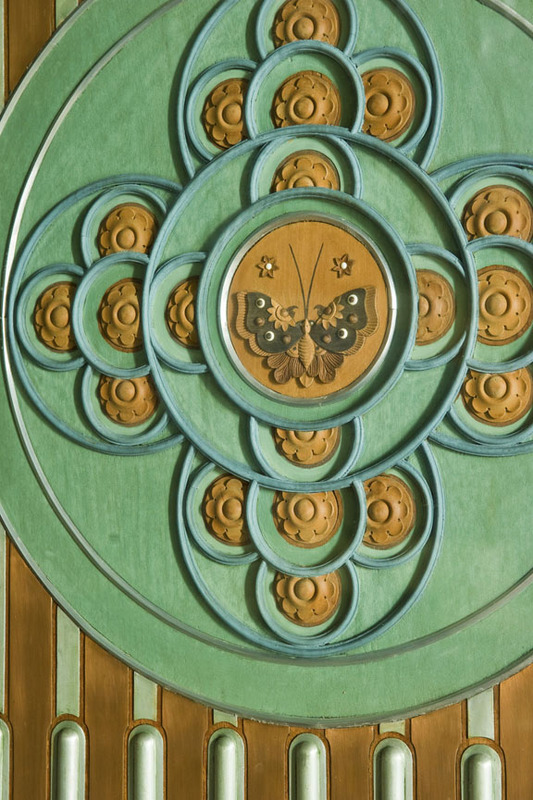 How generous of you to share so much interesting and beautiful history and detail! There is so much to explore and dive deeper into and I particularly enjoyed this. P.S. 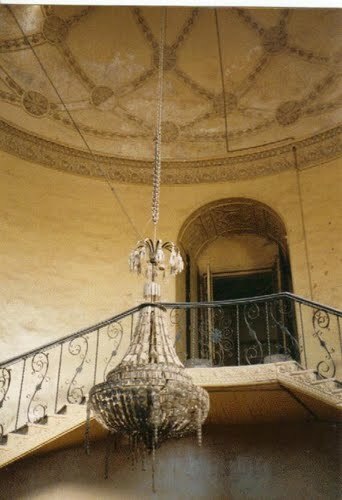 Can only imagine the weight of that Safire turban..! Imagine if he tripped..! 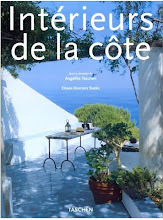 Beautiful photos and fascinating post as always Diane. Your post is quite a coincidence because I just received the book that I ordered, "Made for Maharajas- A Design Diary of Princely India". If you don't have it I think you should add it to your library. JUST LOVELY AND SO FULL OF LIFE AND BEAUTY.. Thank you so much for your heartfelt and wonderful responses. 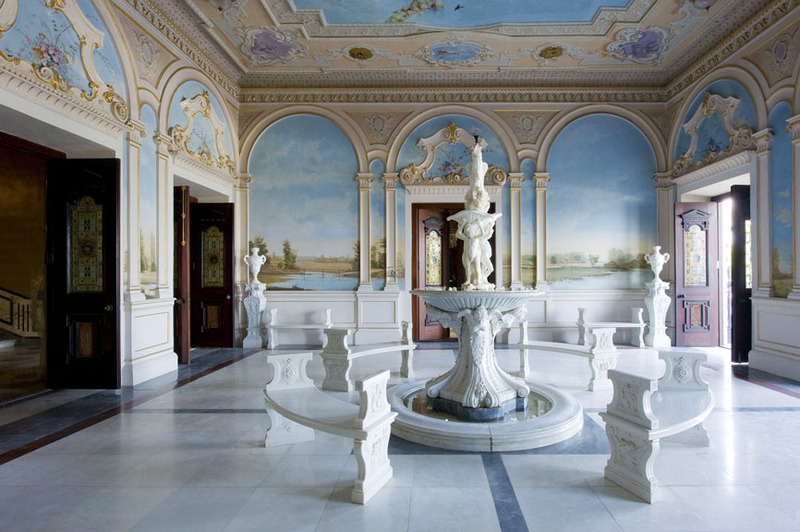 I had seen images of the Falaknuma Palace hotel about a year ago, long before it opened, and decided to go and visit as soon as it opened. 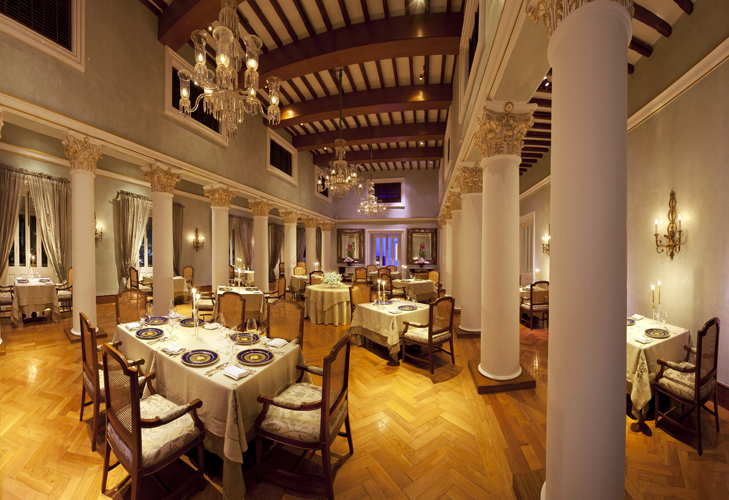 The hotel and Hyderabad were pure discovery. The restoration of the hotel (neglected for decades) was superb--funded by Princess Esra--and as I was there just a few days after it opened, it was untouched and pristine. 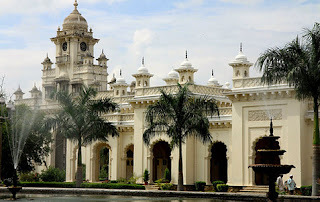 Hyderabad is a city of great history (Cyberabad city if 40 miles away, and the center of all high-tech firms of the world)...and in hidden niches and private corners one can find, with determination, the old palaces and libraries and ballrooms of stunning faded beauty. effort you put into writing this. 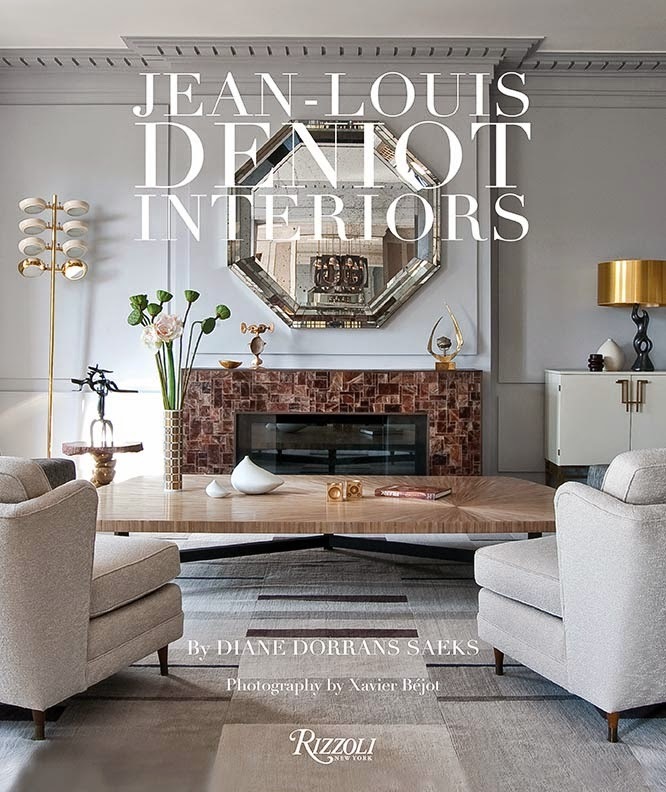 Loved this message via email from the great French photographer, Guy Hervais, with whom I've worked on several of my design/interiors books. Just received your last blog at my return from Italy. Lordy! my grandmother would say! Exquisite beyond description..........you are the most eloquent writer in the world........you paint pictures in our minds......that no one else could even come close to doing! Dodie was a gift to us all! Just a note to say I love your blog and especially your latest trip. Tom and I are returning to India for an Ayurvedic retreat in late January. 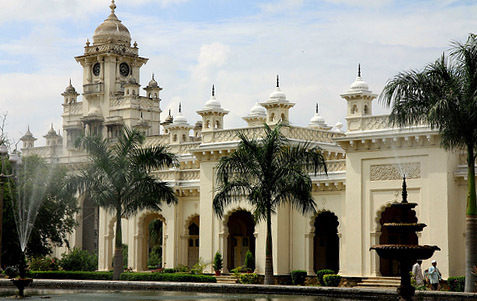 We'll try to stop in Hyderabad to do our own search for the Nizam! 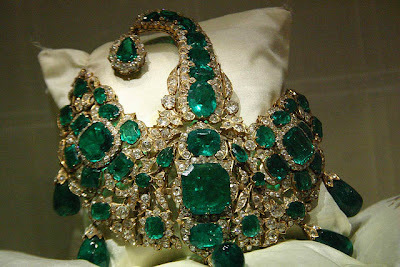 the green emerald turban decoration has stolen my breath. also the ceiling treatment in the spa. Absolutely breathtaking....I felt like going into the magic land of Alladin's cave!! 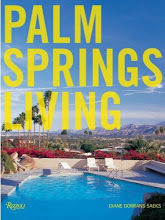 What a gorgeous post, chock-o-block with luscious photos, fascinating commentary, and spectacular subject matter. Incredible! Thank you for taking your lucky (and in the case of this one--dedicated) readers on this delicious journey to the very lap of exotic luxury. 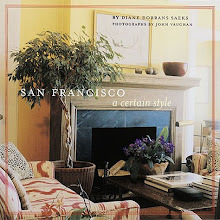 Dear Friends-thank you for your passion and enthusiasm for design and new places and new discoveries, distant lands. Loved hearing from you. I feel so energized by your enthusiasm and ideas and sense of fun! 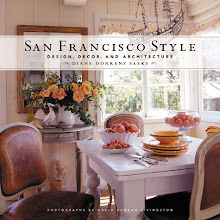 You are the tastiest designer, and have the most magical house and family. You, especially, would love this dream of a palace hotel in Hyderabad. Loved hearing from you. Blaise--dear friend, it is so lovely to hear from you, and of course I'm thrilled to hear you are going to India. If you go precisely to the places I wrote about, you will adore it. It's an adventure! Send me notes from India. 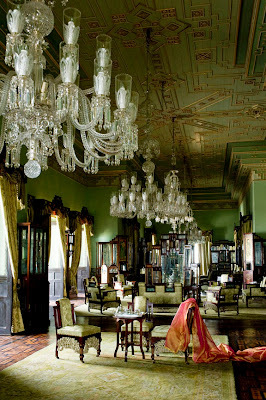 Renee-yes, you are absolutely right...the Falaknuma Palace is, every inch, design inspiration. 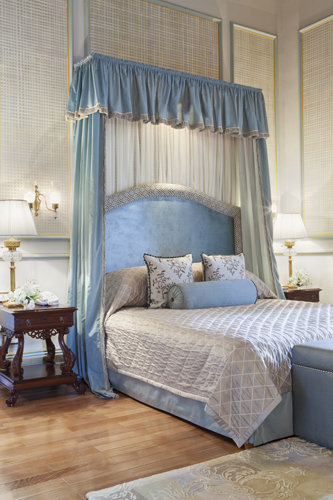 You could spend weeks exploring every room and loggia and suite...and the spa. I hope you can visit. Griffin--this is your kind of palace. 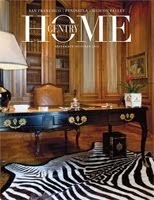 It's a fantasy, created with untold wealth, and an Anglophile/Francophile/Turkophile sensibility...just magical. So rich in history and delight. 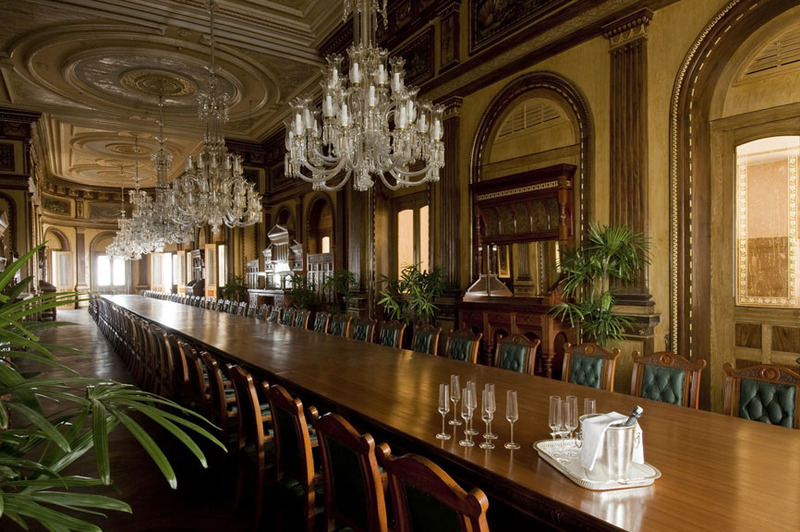 Reggie--I can see you sipping elegant cocktails in this palace hotel. The staff are worldly and lovely and handsome! I could not have been more impressed. This hotel will become a legend. I can not express how I love your posts and texts! You are amazing! We all learn so much of you travelling around the world! And you are so generous to share your experience and all your gorgeous pictures with us! 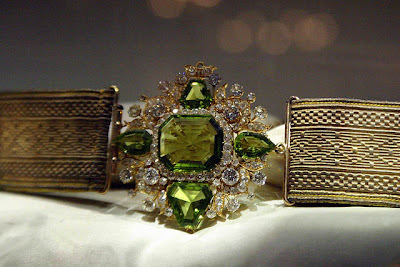 This post 'Chasing the Nizam' is a beauty! I so loved the hotels here! And the beautiful buildings with the European influences! And the storys you write down! 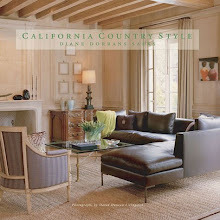 Dear Diane, don't get too used to it... we want you to come back home! A stunning post about an utterly fantastic place. Thanks so much for taking me there for a few minutes on this prosaic rainy morning in Redwood City! Kindest cheers for your safe travels. Mir osman ali the nizam of hyderabad dont have his name in hyderabad ...................just a museum .......and photos of him,.............not even name of the person who has built charminar and asra hospital ........Quli qutub shah..........first of all i say that due to insufficient funds mr mukrram jha has sold all the stuff ...........now the assembly was the royal palace of the family now there will be fighting for Money in that area all our big politicians .......i really thank full to our Congress govt that they kept seized all the belongings of Nizam and put it in there homes .